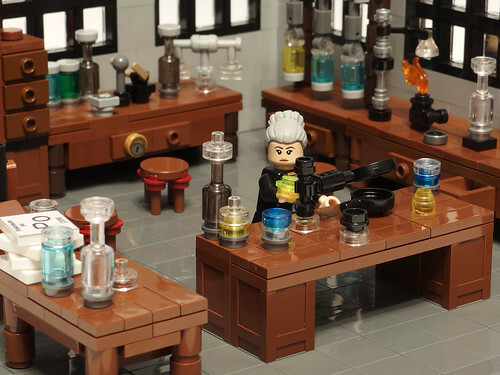 I'd like to present to you my latest work showing famous Noble Prize winner - Maria SKłodowska Curie in her laboratory. This MOC is a part of bigger project by which in this year my community (Zbudujmy To) celebrates 100th anniversary of regaining independence by Poland. 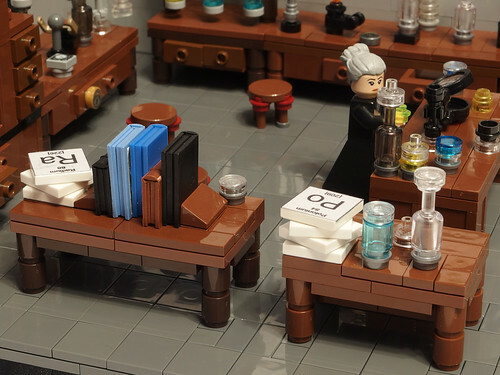 Vignettes and little dioramas are my favorite forms of LEGO creation and in this one I tried to depict the laboratory as well as possible with various furniture and lab equipment. Lovely scene with great details all around! Wow! I can tell you know a thing or two about chemistry... All that lab equipment looks spot on! Love the Curie-ous kids in the window. Thanks. I always try to pay attention to details. Our surroundings are full of the little things which make the word "real". Well, I do indeed. Biology studies and many hours spent if various labs. I hope this receives enough attention on the Ideas website to reach the review stage. I would definitely buy a set like this. There are two things I would change. I don't quite see the point of the floor extending beyond the walls at the open side. Shortening it by 3 studs would make it more compact without compromising anything. On a similar note, I feel the space in the middle is a bit empty with just 3 stools. 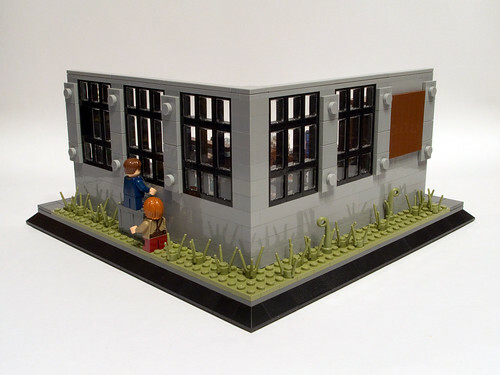 I realize this is realistic but it's not something you would see in a Lego set. Excellent scene recalling some very important discoveries! The lab looks realistic. Also enjoy the "Easter Eggs" of the two radioactive elements on the periodic table. 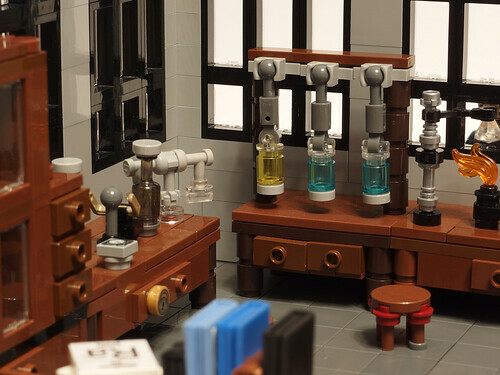 Lovely room ...I can breathe antiquity and science ... the subject is amazing and so is all the excellent laboratory equipment ...I would like to have such a nice studio in my Lego collection! Wonderful build with so many details. 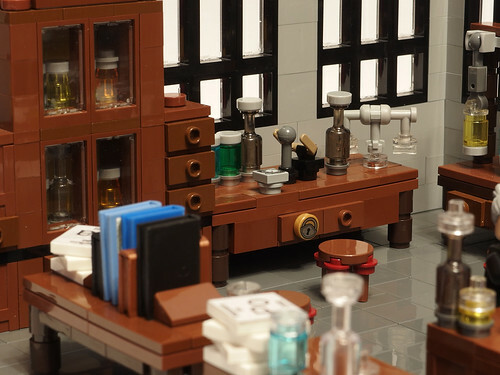 I especially love the lock on the drawer, the bunsen burner and magnifying glass. Hope you voted :-) My first idea was to make the floor as you suggest, but finally it occurred it is not looking good. So decided to make the whole floor tiled with some elements standing outside the outline of the building. I think it is a a matter of taste. I agree that the space in the middle is the something to fill. Maybe some furniture or equipment to play with? These are elements which were discovered by Maria Curie. Name "Polonium" is after her (and mine) homeland - "Poland". I am happy that you recognized the equipment. These two are my favorite ones in this scene. I love also the bunsen's burner, very well made! Excellent scene. You did great including all that chemical lab equipment. 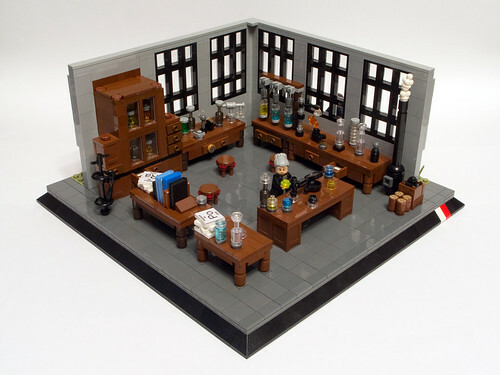 The lab walls and brown benches might look simple, but they fit perfectly to create the atmosphere of labs in early 20th century opposed to the modern labs. This way, at least for me, the lab equipment stands out even more. It's been a while since I was in a chemical lab, so I don't know the names of all the equipment. I'm sure I'd get one if the project is succesful at The Ideas platform. Congratulations and good luck. This is so perfect. Great job on this interior and all the scientific details. Excellent stuff!! 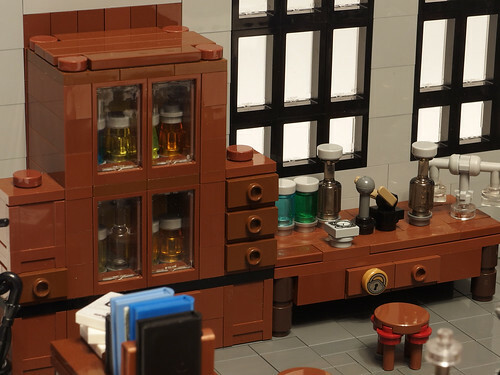 I love all the little details such as the glassware and well stocked cupboards!! 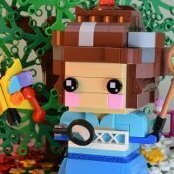 I recently started a Marie Curie MOC (one based on her work in WW1 and her use of "petite-Curies" (mobile medical x-ray machines)) but whether I'll ever get it finished I don't know!! Anyway, good luck with the project!! Thanks. I am also working on little curie's right now and got stuck on mudguards. I wonder how many studs wide is your model? The details are amazing. I am personally fond of the magnifier on the clip. But, I'm an entomologist. Is that a mortar and pestle in the back above the locked drawer? It's good idea to check how the official cars are built. 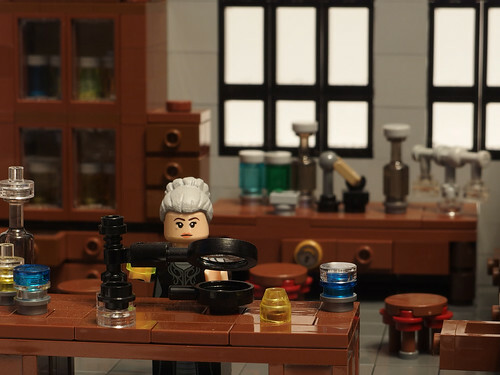 It was some kind of "unnamed-but-intriguing-lego-lab-equipment", but from now it will be the mortar and pestle. Thanks.